If you’re shopping around for children’s recliners you’re likely to encounter Dozydotes, a firm that specializes in making kid’s chairs. A Dozydotes classic rocker recliner could be just the right chair for your little one. Relative to other child recliner brands, Dozydotes chairs tend to be expensive. The price difference can largely be explained by the materials used to construct the chairs. All Dozydotes children’s recliners have all-hardwood frames, whereas some competitors use composite wood or even cardboard in their frames. Real furniture springs are also used in each Dozydotes chairs where other brands use less durable fabric instead. Lastly, Dozydotes uses thick 5.5 inch padding where other brands use only around 3 inch thick padding. In the table below you’ll find a collection of popular Dozydotes classic rocker recliner models to help you narrow down the search for which one may be best for your child. Hopefully you have a better idea of which Dozydotes classic rocker recliner would be best for your child after browsing the table. Below we’ll go into more detail on a few different Dozydotes recliners for those that are still on the fence. 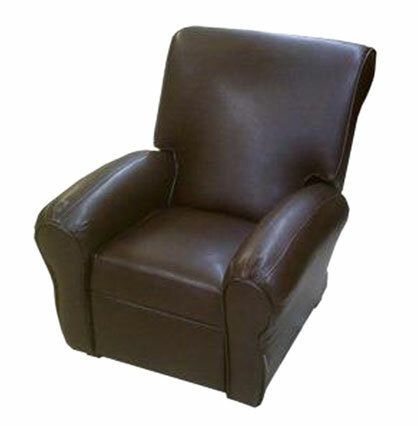 The Dozydotes 11531 Contemporary Pecan Brown Leather is a part of the Dozydotes contemporary collection and looks like a miniaturized adult recliner. It is upholstered in leather-like vinyl that looks great, but is also durable and easy to clean. Dozydotes recommends this chair for children between the ages of 2 and 9, but keep in mind the ages are just a guideline. The chair’s seat height is 14 inches, its width is 14 inches, and its depth is 15 inches. The entire chair measures 28 inches high by 25 inches deep by 23 inches wide. It has a weight capacity of 100 pounds. The Dozydotes Kid’s Home Furniture Rocker Recliner looks more like a child’s chair, featuring cute buttons and piping details. This chair is upholstered in microfiber, which has the advantage of being soft, cozy, and durable. On the downside, microfiber furniture is not the easiest to clean. If you have a mess-prone child keep that in mind. Dozydotes recommends this chair for children between the ages of 2 and 9. The chair’s seat height is 14 inches, its width is 14 inches, and its depth is 15 inches. The entire chair measures 22 inches wide by 24 inches deep by 27 inches high. Like most Dozydotes chairs, it has a weight limit of 100 pounds. The Big Kids collection is slightly larger than the rest of the Dozydotes fleet. 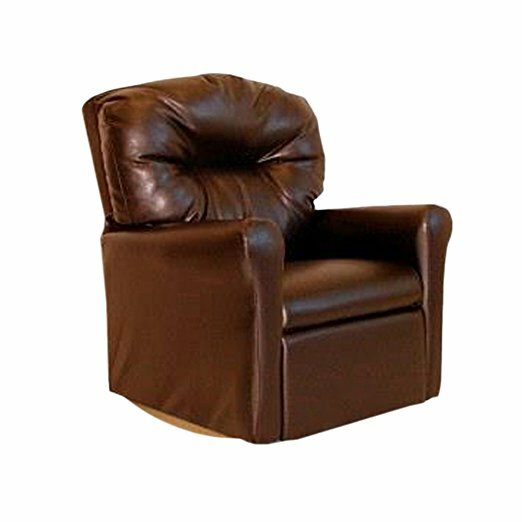 The Dozydotes Big Kids Recliner Pecan Leather is one of the most contemporary looking chairs in the Big Kids collection. The chair’s upholstery is imitation leather that is durable and easy to clean. As you can imagine, this chair’s seat is slightly bigger than the other highlighted models; its seat height is 15 inches, the width is 14 inches, and the depth is 16 inches. The whole chair measures 24.5 inches wide by 32 inches deep by 30 inches high. It can support up to 130 pounds.